Elvira the Woodland Elf pattern provides full instructions for making a lovely elven doll, her accessories, anime-style eyes, and beautiful hair! She wears a little, green dress over a pair of laced over-the-knee tan boots. Elvira’s dark brown hooded capelet (mini cape!) also helps her blend into her woodsy surroundings. 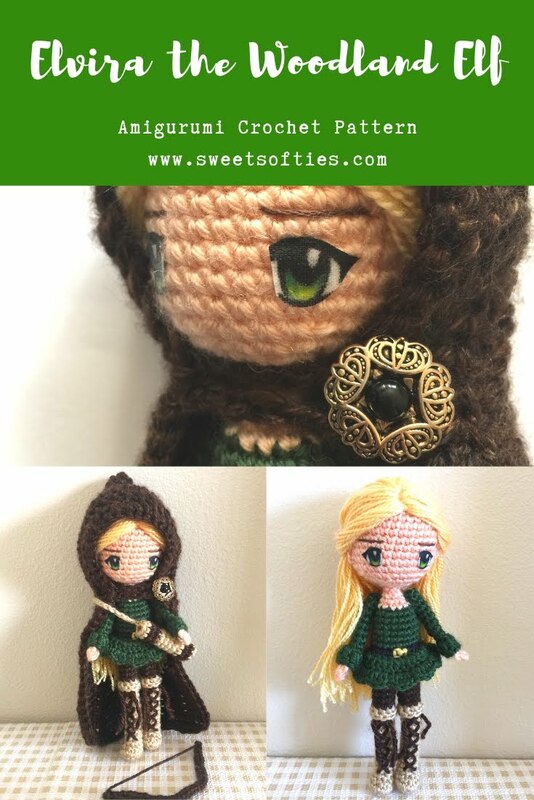 Like every elven member of her clan, she never leaves the security of her home without her trusty bow, arrows, and quiver. She is my most complex amigurumi doll thus far, and I'm so thrilled to finally figure out how to create anime-style eyes without embroidering! THIS PATTERN CONTAINS: 20 pages of written crochet instructions (US terms) on how to make the doll in its entirety. It is a comprehensive pattern/tutorial jam-packed with photos and written instructions. This also includes a tutorial on the doll’s hair, anime-style eyes, and clothing/accessory details.